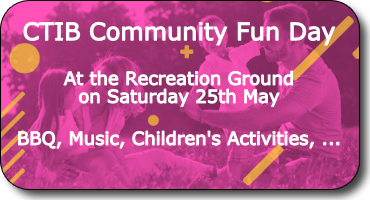 The Churches Together in Bourne (CTIB) are holding a third family fun day on Saturday 25th May 2019. Come along to listen to musical performances and watch the ‘Open the Book team’ dramatising one of the well-known Bible stories. Burgers and sausages will be available from the barbecue, teas and coffees from the Salvation Army’s emergency vehicle, plus a cake stall. For the children there is face painting, glitter tattoos, giant floor games … not forgetting the bouncy castle!